[155 Pages Report] The Subscriber Data Management market size is estimated to grow from USD 1.97 Billion in 2016 to USD 4.44 Billion by 2021, at a Compound Annual Growth Rate (CAGR) of 17.6%. The need to reduce Operational Expenditure (OpEx) & enable cross-network consolidation, increasing subscriber demand for Long-Term Evolution (LTE) & Voice over LTE (VoLTE), deployment of Internet Protocol Multimedia Subsystem (IMS), and movement of telcos towards Network Function Virtualization (NFV) are some of the factors fueling the growth of the SDM market across the globe. The base year considered for this study is 2015 and the forecast period considered is 2016–2021. The SDM ecosystem comprises SDM solution providers, such as Ericsson (Kista, Stockholm), Hewlett Packard Enterprise (HPE) Company (California, U.S.), Huawei Technologies Co. Ltd. (Shenzhen, China), Nokia Corporation (Espoo, Finland), Oracle Corporation (California, U.S.), Amdocs Inc. (Missouri, U.S.), Cisco Systems, Inc. (California, U.S.), Computaris International Ltd. (Essex, U.K.), Openwave Mobility, Inc. (California, U.S.), Procera Networks, Inc. (California, U.S.), Redknee Solutions, Inc. (Ontario, Canada), and ZTE Corporation (Shenzhen, China). Other stakeholders of the Subscriber Data Management market include Communication Service Providers (CSPs), Mobile Network Operators (MNOs), Mobile Virtual Network Operators (MVNOs), Mobile Virtual Network Enablers (MVNEs), Mobile Virtual Network Aggregators (MVNAs), and system integrators. SDM manages subscriber data across heterogeneous domains of network in a converged way. SDM solution consolidates and manages the network carrier’s subscriber data that encompass access preferences, services, locations, authentication, identities, and presence into unified data repositories. Moreover, it benefits the carrier networks by reducing their operating expenses while providing subscribers with consistent service experiences. It also allows operators to view subscriber data in a centralized fashion, which enables them to effectively monetize their subscriber data. Furthermore, SDM helps telecom operators in reducing network complexities, total cost of ownership, and time to market for new services. Need to reduce OpEx and enable cross network consolidation, increasing subscriber demand for LTE and VoLTE, deployment of IMS, and movement of telcos toward NFV tools will fuel the growth of Subscriber Data Management market. The value chain of the SDM market can be analyzed by the number of intermediaries involved in the ecosystem of this market space. Various industries are deploying the SDM model across the world. The SDM market is a highly fragmented market with the presence of a large number of local and global players catering to the needs of the telecom operators. Large enterprises are deploying these services at a substantial rate; however, the SMEs are expected to show the highest growth rate during 2016–2021. Third parties can be useful to telecom operators with new value chains which would be recognized slowly but definitely and help deliver new and advanced facilities. Telecom operators are exploring the prospects for offering similar levels of personalization and tracking of customer behavior. Subscriber data is potentially very attractive to third parties to augment the services they can offer, using the telecom operators infrastructure. It can also be provided in an anonymized format to advertisers. 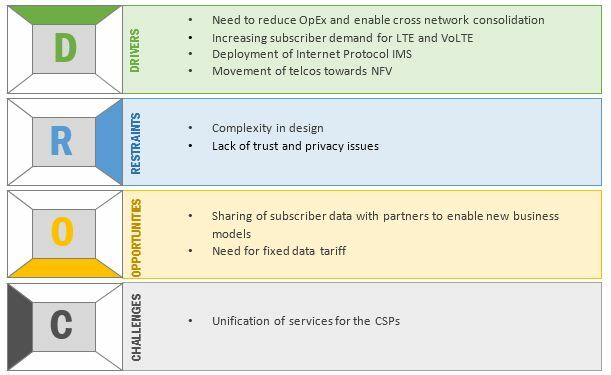 In the last decade, it has been realized that substantial value can be delivered if the CSP moves from the standalone network database approach to a holistic SDM approach. With this evolution, SDM can add noteworthy value by providing a consolidated view of subscribers and their behavior. It can also deliver efficiencies by reducing the number of SDM silos. For example, Amazon, eBay, Google, and Yahoo are some of the internet companies that have validated the pull of a business model founded on flexible customized way of services and following customer preferences. Competitive pressures are the main reasons that are driving mobile and broadband CSPs to offer fixed data tariffs. As a result, CSPs are facing intense competition in data traffic and inadequate revenue growth to sustain the essential arrangement to be build-out. In some instances, it is also possible that subscribers create an unbalanced contribution to data growth by sharing large media files. SDM can assist CSPs address this issue by supporting subscriber specific policies. This authorizes the CSP to deal a number of “flat rate” data tariffs with differing caps on bandwidth, overall data volume, and allowed services. The Subscriber Data Management market is expected to grow from USD 1.97 Billion in 2016 to USD 4.44 Billion by 2021, at a Compound Annual Growth Rate (CAGR) of 17.6% during the forecast period. The growing subscriber demand for Long-Term Evolution (LTE) & Voice over LTE (VoLTE), movement of telcos towards Network Function Virtualization (NFV), increasing need to reduce Operational Expenditure (OpEx), and enabling cross-network consolidation has led to the increased demand for SDM solutions. The SDM market has been segmented based on solutions, network types, application types, organization size, deployment types, and regions. The subscriber data federation segment in solutions is expected to grow at the highest CAGR during the forecast period, while policy management is projected to have the largest market size in 2016 in the Subscriber Data Management market. The demand for subscriber data federation is increasing as it provides telecom operators with an integrated view of information from diverse data repositories and also facilitates assimilation between unlike systems or applications by providing access to protocol translation, transactions, data schema manipulation, and data transformation. Mobile networks are expected to grow at the highest CAGR during the forecast period in the network types segment and is also estimated to have the largest market size in 2016. The number of mobile subscriptions worldwide is increasing exponentially, which eventually is increasing the mobile networks market. Furthermore, mobile networks are expected to grow at a fast rate due to the increasing demand for mobile connectivity in locations with lack of terrestrial infrastructure; as a result, the subscriber base has increased. The Voice over Internet Protocol (VoIP) and video over IP segment among the SDM application types is expected to grow at the highest rate in the Subscriber Data Management market during the forecast period. The emergence of 4G LTE has given a push to the VoIP and video over IP industry. Moreover, the arrival of 5G is expected to expand this segment further and will enable SDM application in this segment to grow at the fastest rate. SDM application in mobiles is estimated to have the largest market size in 2016. As there is a potential rise in the number of mobile devices and mobile users, there is a need for telecom operators to be able to synchronize this subscriber data with ease, thus leading to the creation of the largest market size for mobile segment. The Small and Medium Enterprises (SMEs) segment is expected to grow at the highest CAGR in the SDM market during the forecast period. The medium-sized companies are significantly growing in this market by shifting from traditional SDM solution to next-generation SDM platform. They are more inclined towards cloud-based solutions for managing their subscriber data with the optimal utilization of resources. The cloud deployment type is expected to grow at the highest rate in the Subscriber Data Management market during the forecast period. This type of deployment requires less capital investment, offers high scalability, and could be offered through subscription-based pricing models, thus, having the fastest growth rate. 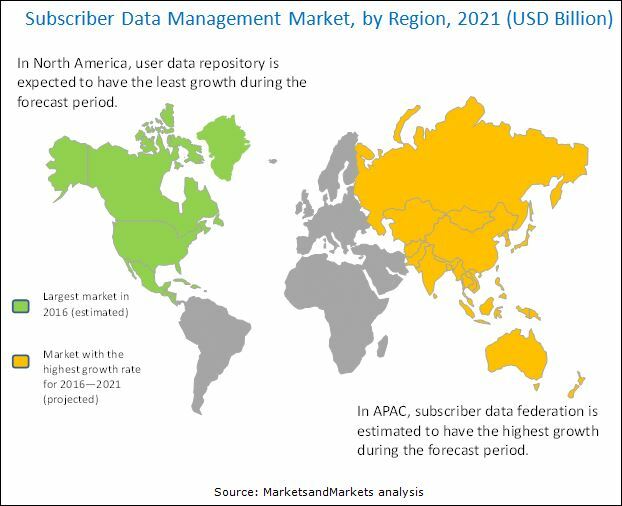 North America is expected to have the largest market share in 2016, whereas the Asia-Pacific (APAC) region is expected to grow at the highest CAGR from 2016 to 2021, in the Subscriber Data Management market. North America leads the world for LTE; moreover, VoLTE adoption and increasing cloud-based monetization solutions are the major drivers for SDM growth in this region. The key reason for the high growth rate in APAC is the enormous population of this region, which has led to an extensive pool of subscriber base for the telecom companies. The adoption of SDM is increasing in the market owing to the exponential rise in the number of subscribers. However, complexity in design and lack of trust & privacy issues are acting as barriers to the adoption of SDM solutions. The major vendors in the Subscriber Data Management market include Ericsson (Kista, Stockholm), Hewlett Packard Enterprise (HPE) Company (California, U.S.), Huawei Technologies Co. Ltd. (Shenzhen, China), Nokia Corporation (Espoo, Finland), Oracle Corporation (California, U.S.), Amdocs Inc. (Missouri, U.S.), Cisco Systems, Inc. (California, U.S.), Computaris International Ltd. (Essex, U.K.), Openwave Mobility, Inc. (California, U.S.), Procera Networks, Inc. (California, U.S.), Redknee Solutions, Inc. (Ontario, Canada), and ZTE Corporation (Shenzhen, China). These players have adopted various strategies such as new product development; mergers & acquisitions; partnerships, agreements, contracts, and collaborations; and business expansions to cater to the SDM market. 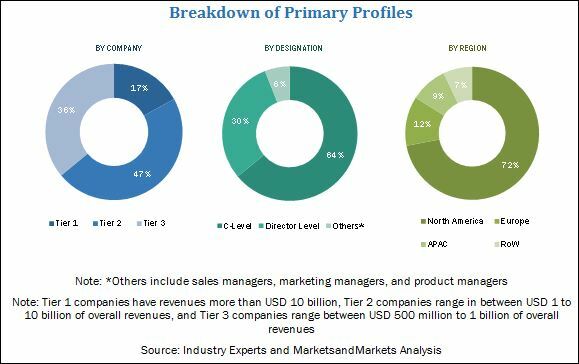 The growth SDM market is depending on the factors, such as need to reduce OpEx and enable cross network consolidation, increasing subscriber demand for LTE and VoLTE, deployment of IMS, and movement of telcos toward NFV are expected to drive the market growth. Policy-based differentiation of data requests the prioritization of critical apps over non-critical apps. Players such as Bridgewater (now acquired by Amdocs) have added a policy controller that panels subscribers’ access to network resources, quality of service, and applications. Subscriber-centric policy management permits the service providers to adjust to the distribution of network resources according to the subscriber’s payment. Hence, it focuses on the right size of resource allocation with the right size of pricing for networks. This helps improve business models with premium quality of IT services with proper management from service providers. 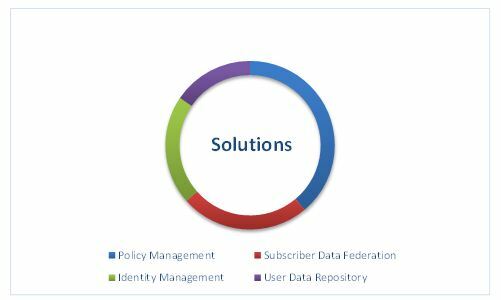 Policy management gives network independence, provides a repository of subscriber profiles, and rules for carrying subscribers & applications together. The service provider has the authority to define these rules or policies, and the policy management system administers those rules on a per-subscriber basis. With the emergence of IMS architecture, policy is directly accessed through Policy Decision Function (PDF), HSS and PCRF. These modules of the architecture comprise centralized subscriber and application outlines and policies. The PCRF regulates policy for IP data flows and applies for QoS management. The HSS empowers the profiles to implement policy in the network by a logical chain of procedures. After a subscriber accesses an application, it is approved by the HSS at the point of request. This policy management can also be used by the Digital Subscriber Line (DSL), cable, or 3G service providers with benefits, such as proper usage of bandwidth and granular usage intelligence to develop new services. As the subscriber data is spread over multiple application silos, SDF enables the telecom operators to manage these multiple silos of data stores with flexibility, thus providing a single view, sometimes also referred to as virtual directory. This provides an integrate view of information from diverse data repositories. It supports multiple virtual schemas, protocols, and data transformation. This solution has enabled access to previously inaccessible data. Accessing data from multiple data servers through a unified interface and accessing data with an only request is the main objective of SDF. It also facilitates assimilation between unlike systems or applications by providing access to protocol translation, transactions, data schema manipulation, and data transformation. Data and protocol federation abilities permit operators to generate a unified interface for all applications to access data from all repositories. Identity management is basically about managing and authenticating the identity of a user. In SDM, some components of the identity management segment are Equipment Identity Protocol (EPR) and Lightweight Directory Access Protocol (LDAP). Moreover, network databases, such as HLRs and AAA servers also act as keepers for subscriber profiles for authentication and facility configuration to maintain real-time performance of services. Customer access to web portals and web services are managed by identity management systems. It also does mobility management, accounting, and some server settings for the GSM service. The subscriber data that is to be handled includes identity information, such as International Mobile Subscriber Identity (IMSI) & multi-Mobile Subscriber Integrated Services Digital Network (MSISDN), personalization information, authentication information, policy settings, and settings for specific services. Along with this it enables operators to share subscriber information which mainly includes identity, context, and preferences, with third parties while taking care of the security issues. In SDM, the main component is its subscribed data; hence, the data should be stored with the utmost care. As the quantity is too large, proper management is also needed. A huge number of user data arrive regularly and are placed at multiple databases at multiple locations for which sometimes complexity arises. It is basically a facility where the user data can be retrieved, stored, and managed in a collective way; it also enables data integrity that performs as a solo logical storage of user data and is unique from application front-end’s perspective. The user-related data that is usually stored in the application servers, HSS/HLR, and others is now stored in the UDR as per to a UDC information model. User identities (MSISDN, IMSI, IMPU, and IMPI), authentication data, and service data (service profile in IMS) are the examples of subscription data. Many companies offer UDR solutions, such as Ericsson’s 8661 directory server that act as an open repository of data that can simultaneously support various applications. The scope of UDR solutions is high with respect to redistribution capabilities, integrated data distribution, routing, configurable data replication, and consistency policies for optimal resource utilization. Which are the top use cases where SDM can be implemented for revenue generation through new advancements? What are the potential opportunities in the adjacent markets, such as cloud billing database and telecom system integration?